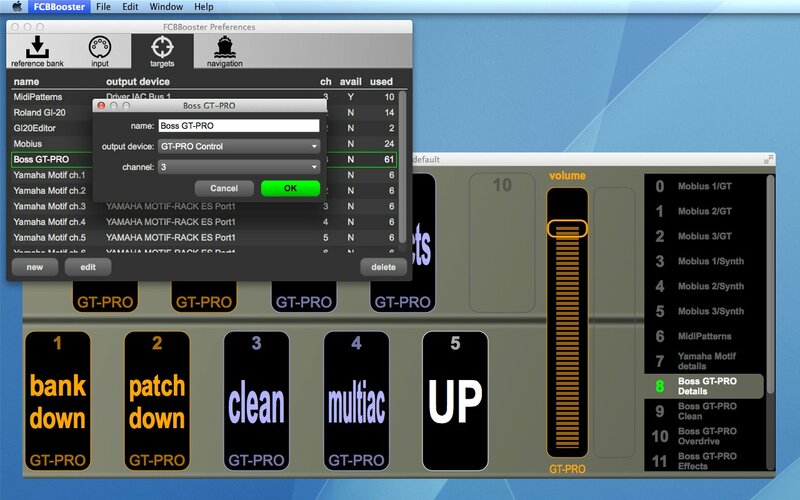 Altough able to receive, send, save and load FCB 1010 sysex dumps, FCBBooster is not a software editor for the Behringer pedalboard. Actually, its purpose is to abolish the need to program the pedalboard. Take advantage of the visual feedback to mantain control over complex arrangements. Save complete setups as documents, for backup purposes and fast switching between different configurations. 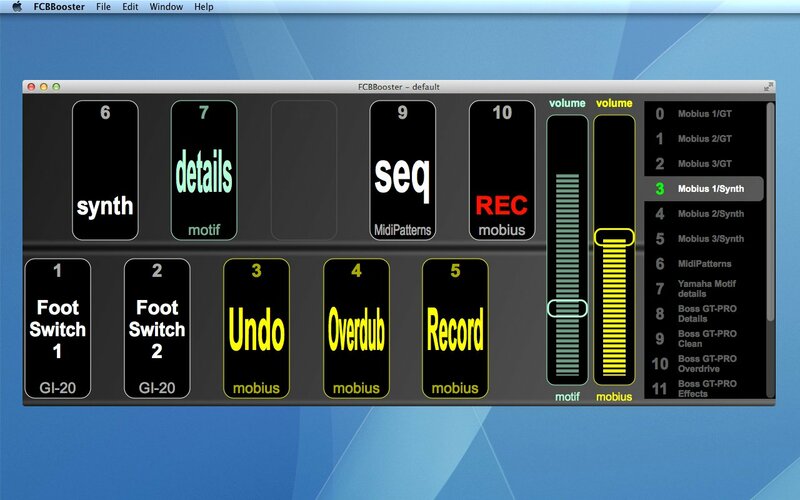 Send a virtually unlimited number of midi messages to a virtually unlimited number of devices simultaneously, from each footswitch or expression pedal. Send messages that the FCB 1010 is not able to manage, like system exclusive or channel pressure messages. Use simple but powerful programming features and a clearly laid out editor to define complex functions that would be impossible to handle for a FCB 1010. Make footswitches act like buttons, switches or multiple state switches. Decide if a message must be sent when a footswitch is pressed or released. Program the order and the timing of the messages. Use a single FCB 1010 bank as the source for signals, then define up to 32768 patches and use FCBBooster's navigation mode to select them. Or use all ten FCB 1010 banks, program up to 10 patches and select them with the up/down switches on the pedalboard. The latest Windows version is a 32-bit application that runs on XP and later versions. It is distributed as shareware so, if you use it, you are required to make a donation of € 11.99 or $ 14.99 through the PayPal button below. Fixed a bug which prevented the reloading of documents containing "wait" actions. 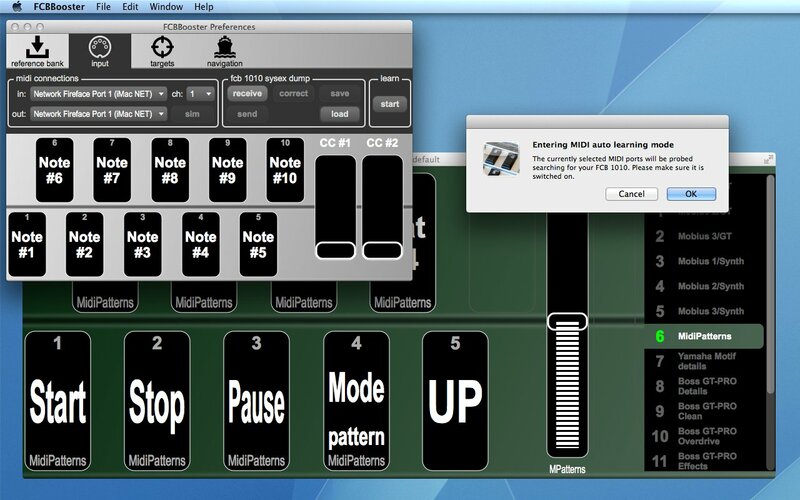 MIDI destination devices and channels are now coupled as "targets" and defined just once in the preferences window, instead of being specified multiple times on an action-by-action basis. Multiple state footswitches can now optionally expose their current state to all actions belonging to the same patch, so that these can be programmed to perform only when a control is in a particular state. 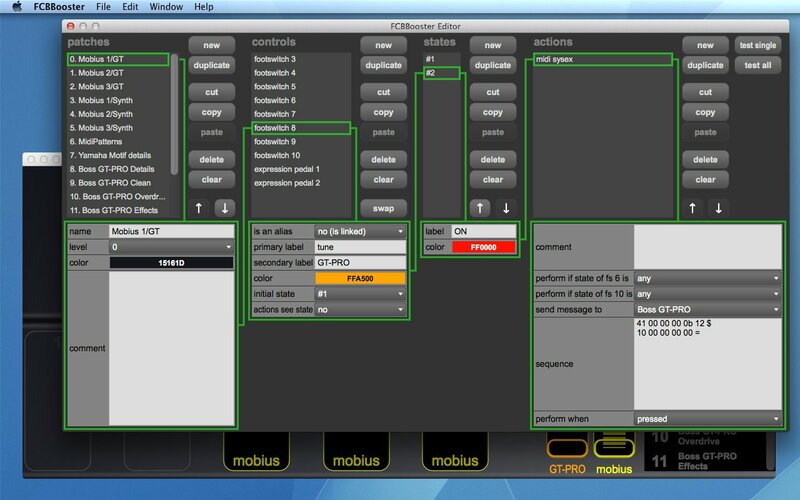 Interfacing with the FCB 1010 has become much easier: FCBBooster is now able to receive a SysEx dump from the pedalboard or load it from a file, apply the possible needed corrections and send it back without requiring any programming on the FCB 1010 (the old step-by-step learn mode is still available); FCBBooster can also save SysEx dumps to a file for backup purposes. The "patches setup" window, now simply called the editor window, has a new, clearer layout, with green lines and boxes indicating the relationships between patches, controls, states and actions; when the editor window is open, the currently selected control is shown with a red border in the main window. There are new "cut", "copy" and "paste" buttons for each of the "patches", "controls", "state" and "actions" sections; the "controls" section also has a new "swap" button to easily exchange position between controls of the same kind. A new "reference bank" preference allows to choose between the traditional mode of operation, that uses a single FCB 1010 bank as source for MIDI messages, and a new "all banks" mode, that limits the number of the definable patches to ten, but lets you select them with the up/down keys on the pedalboard. Some new MIDI actions are available: "all sound off", "all notes off", "reset all controllers" for footswitches and "channel pressure" for expression pedals. A new "wait" action may be used to introduce a delay between actions; this can be useful to let some hardware devices digest complex sysex messages before sending them other messages. There is a new, unified preferences window. 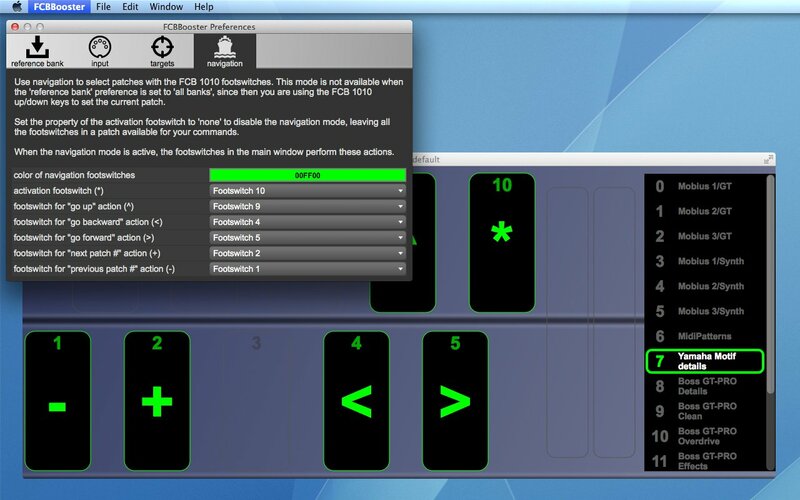 The "navigation" mode is now not immediately dismissed when a footswitch is pressed; instead it stays active until the "*" activation footswitch is pressed again; the current destination patch is highlighted with a green border in the list at the right side of the main window. The "go to patch" action now supports special destinations like "higher in level", "last visited", "next visited", "previous in list", "next in list", which are analogous to the navigation mode commands.